The RGM Plus line is characterized by its extremely flexible blade and by a special electrolytic rust proof protection that optimizes the functionality of the palette knife and the spread ability of the colour, as well as ensuring maximum durability. The New Age collection offers a new generation of palette knives. 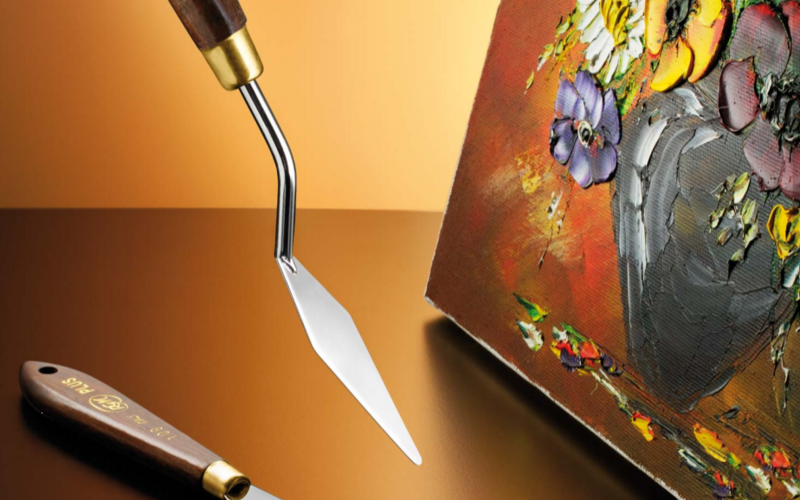 Thanks to the variety of forms and the use of new production technologies, the palette knife becomes the instrument to replace the paintbrush, creating unique effects by impressionistic touches, making these palette knives essential for anyone who wants to express the spontaneity of his style. The unique edges give the artist infinite possibilities when it comes to the effects that you can create.These new knives are created for all pastes, such as mortar, gels (matt gel, gloss gel, Heavy gel), modelling pastes, gesso, as well as traditional oil and acrylic paint straight from the tube. Features: each palette knives consists of different shapes and characteristics, unique in their kind, the blade is tempered and ground manually to ensure optimum constant flexibility, the blades have a special water-resistant protection. Take your paintings to the next level with these uniquely shaped painting knives.